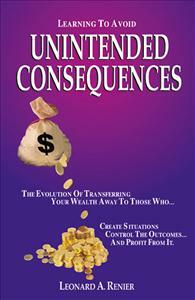 Learning to avoid the unintended consequences of transferring your wealth to others unknowingly and unnecessarily, should be everyone’s goal. If something you thought to be true, wasn’t true, when would you want to know about it? In your financial world, that defining moment occurs by understanding the Efficiency of Money. Learning to avoid the unintended consequences of transferring your wealth to others unknowingly and unnecessarily, should be everyone’s goal. This book will show you how to recognize and overcome these transfers. It will identify those who create the transfers and how they do it. They are destroying our personal wealth by creating situations, controlling the outcomes, and profiting from it. Truth and knowledge will reduce or eliminate these transfers. I was very excited when Mr. Renier decided to write this book. He has been educating many people including myself and my wife for more than 10 years. Everyone should get a copy of this book and make an effort to get him or one of his team members to consult with you on your future. He has made it possible, with these ideas for me to retire and live life without any worries. Don't waste anymore time on traditional financial thinking-go to a new level and read this book, you will wonder why you never heard these ideas or learned to utilize them before today! Entertaining format-Crucial information. Be prepared to shift some cherished paradigms and ACT on new ones. The truth will set you free!! Anyone who is going to handle their money,and do it smartly,must read this book.Age does't matter,the sooner you read and understand this book the better off,money and security wise you will be. The real truth about who will take care of you is in this book. I have been asking the question for years, "if financial planning is working in America then why are so many people broke?" Your book answers that question quite early. It also explains why things will only get worse if changes are not make in the planning process. I am giving this book to all my clients and prospective clients and I have had nothing but very positive feedback from all who have read it. Americans need good sound financial advice and you have done just that in your book. Congratulations and than you for having the vision and courage to put this into print. This book is a wonderful resource in understanding people's financials from a macro point-of-view. It helps you take a step back from the choas of financial information that is out there and begin to see clearly. This book will be a Christmas present to all of my loved ones. It's true worth is infinite in creating more money to spend and enjoy.